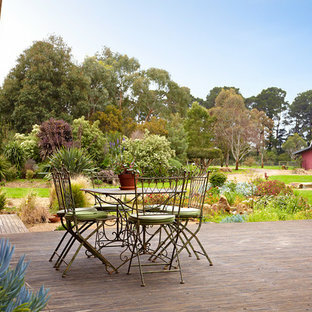 Design ideas for a traditional deck in Melbourne. Photo of a traditional rooftop deck in Perth with no cover. 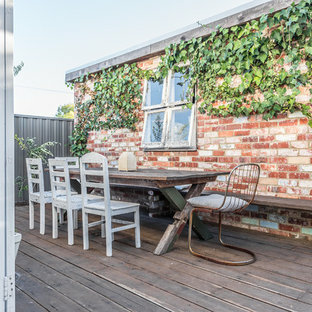 Photo of a small traditional backyard deck in Brisbane with a roof extension. 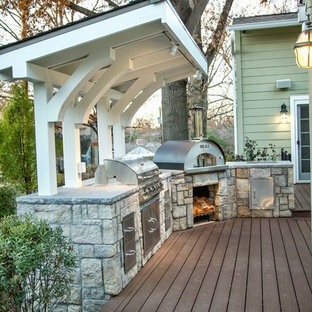 Mid-sized traditional backyard deck in Kansas City with an outdoor kitchen and a pergola. Large traditional backyard deck in Other with an outdoor kitchen and a roof extension. Photo of a traditional deck in Chicago with a container garden and a pergola. Photo of a mid-sized traditional backyard deck in Cleveland with no cover. Design ideas for a mid-sized traditional backyard deck in Seattle with a container garden and a roof extension. Traditional backyard deck in Providence with a pergola. Project designed and built by Atlanta Decking & Fence. 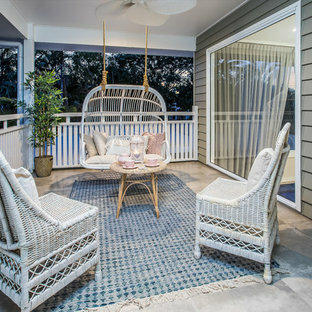 Inspiration for a traditional deck in Atlanta with a pergola. The original multiple decks and elevated patio blocked the pool and fractured the space. This design creates an elegant progression from the home’s interior to poolside. The wide stairs oriented towards the pool provide pool views from the entire deck. The interior level provides for relaxed seating and dining with the magnificence of nature. The descent of a short group of stairs leads to the outdoor kitchen level. The barbeque is bordered in stone topped with a countertop of granite. 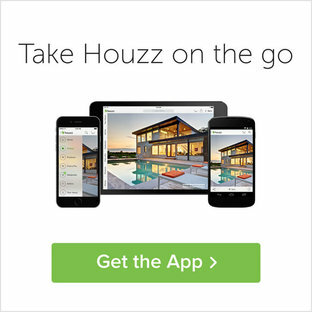 The outdoor kitchen level is positioned for easy access midway from either the pool or interior level. From the kitchen level an additional group of stairs flow down to the paver patio surrounding the pool. Also incorporated is a downstairs entry and ample space for storage beneath the deck sourced through an access panel. The design connects the interior to poolside by means of a rich and functional outdoor living design. Trex Select railing in Classic White and Pebble Grey cocktail rail. 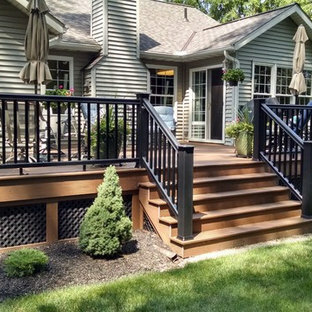 This deck also features Square LED Post Cap Lights and Stair Riser Lights from the Trex Deck Lighting collection. 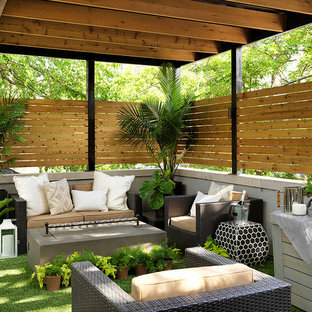 Inspiration for a small traditional rooftop deck in New York with a container garden and an awning. 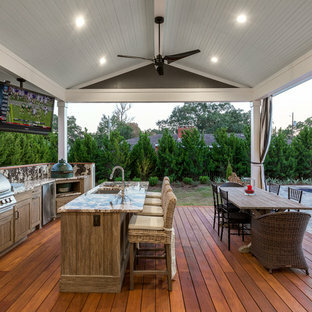 This is an example of a traditional backyard deck in Atlanta with a roof extension. Photo of a large traditional backyard deck in Cincinnati with a fire feature and a roof extension. Photo of a large traditional backyard deck in DC Metro with an outdoor kitchen and a pergola. 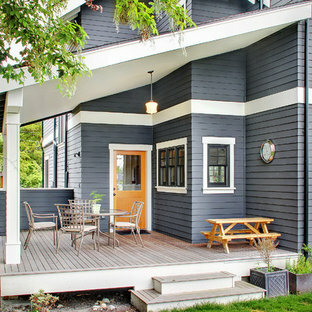 Design ideas for a traditional backyard deck in Seattle.